Another busy week of collecting information comes to an end and I wasn't able to talk about several topics I promised to get into earlier this week. With everything going on in Danbury and across the state, and with several of HatCityBLOG's researchers on vacation, it's difficult to stay on top of things. I promise that I'll follow-up on everything very soon. As always, if you see or know of something that might be of interest, please email the site at hatcityblog@yahoo.com. I attended the taping of Ivon Alcimé's "Ideas at Work and Beyond" featuring Mayoral candidate Helena Abrantes, 2nd ward candidate (and the person Mayor Boughton quotes as "not doing his homework"), Ken Gucker, and the person who will finally give the so-called City Clerk Jean Natale her long overdue walking papers, City Clerk candidate Eileen Coladarci. During the show, Gucker and Coladarci introduced themselves to the public offering insight into their backgrounds as well as comment on their reasoning for running for office. In the main attraction, Abrantes unveiled her campaign strategy by outlining her six point vision for Danbury while carefully critiquing Mayor Boughton on a range of issues. All in all, it was possibly the most informative insight into Abrantes outlook for Danbury to date and if the response to the show is any indication, one should not take this election lightly. The show is available for viewing over at the Ideas at Work and Beyond website. This week, Western Connecticut State University helped out one family who received a fell-deserved "Extreme Makeover". The ABC program, which was rebuilding the house of the Brown family in Bridgeport, received a generous donation from Western as the university offered to pay Ms. Brown's children their tuition for four years. It's a generous gift to a wonderful family and you'll be able to see the episode on ABC later this year. (As a big fan of the Young Democrats, I had the opportunity to to a report on the latest Fairfield County chapter of the organization in Stamford. This is a crosspost I did for My Left Nutmeg earlier this week). As a follow-up to my post on Jim Himes, here's my full video report from Sunday's Southern Fairfield Young Democrat BBQ in Stamford. You can find more information on the Connecticut Young Democrats by visiting their website. If your not doing anything tonight, make sure to tune into Comcast channel 23 tonight at 9:00 as HatCityBLOG will be making it's video premiere on "Ideas at Work and Beyond." Tonight, you'll have an opportunity to view my video footage as it was meant to be seen (well, almost as I had to transfer the digital video onto videotape) without the degrading quality you see on the internet. Tonight's program will feature footage from the Democratic Town Committee convention and the nomination speeches of Democratic City Clerk nominee Eileen Coladarci and Democratic Mayoral nominee Helena Abrantes. Is Olbermann's choice for "Worst person in the world" realted to the mayor? This sounds like an ordinance Boughton would push from Danbury...if he could somehow link it to immigration. I just sent Olbermann's staff a copy of the unconstitutional parade ordinance as well a link to this site. We'll see if Boughton and his Republican pawns of the Common Council made to cut for worst person people in the world...Lord knows that they're the worse in Danbury. Sorry for the lack of posts here today. It's not like I don't have anything to bring to everyone's attention (e.g., BRT Crosby Street apartment scam, the ongoing parade ordinance scandal, the inability of the Republican leadership of the Common Council to effectively govern, using the topic of immigration for political purposes, tracking Mayor Boughton endless misleading statements and of , etc), it's just that I'm putting the finishing touches on Sec. of State Susan Bysiewicz's live blog at My Left Nutmeg. If you can't join the discussion at 6:30, a full transcript of the guest post will be available later tonight. UPDATE: The live blog is over and you can read the full transcript of Sec fo State Bysiewicz by clicking here. Will he simply resign already! 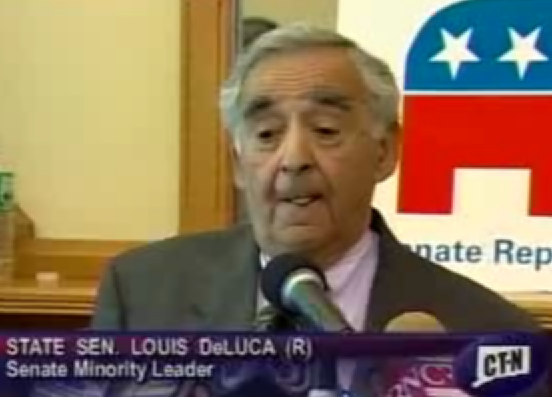 The state Senate will form a bipartisan committee to investigate and possibly discipline former Senate Republican leader Louis DeLuca following his guilty plea for conspiring to threaten his granddaughter's husband, top senators announced this afternoon. The six-member committee, composed of three Democrats and three Republicans, will be named within the next two weeks, and the full Senate could vote in November on whether to reprimand, censure or expel DeLuca. The committee could also decide to take no action following a series of public hearings. "The committee will be thorough and deliberative, and will consider a variety of disciplinary options,'' Williams said, noting that DeLuca would be given the chance to present his case. DeLuca was arrested in June on a warrant after the FBI stated that DeLuca met with Danbury trash hauler James Galante in April 2005 in order to have Waterbury resident Mark Colella intimidated because DeLuca believed that Colella was abusing his wife, Casey - DeLuca's granddaughter. Colella has denied the allegations, and DeLuca has repeatedly refused to resign as a senator over the past two months. This whole embarrassing episode of the senate disciplining one of their own could all be avoided if "Looney" DeLuca would simply do the right thing and simply resign. The fact that he hasn't resigned, or that the Republican leadership hasn't place pressure on him to step down, is simply mind-boggling. DeLuca had dealings with James Galante, an individual on trial for tax fraud, racketeering, and extortion based on a federal probe of organized crime in Danbury's trash industry. DeLuca promised an undercover agent that he "would use his influence to discover anything that could hurt Galante, and "'blunt it as best I can.'" Waterbury's Chief of police Neil O'Leary directly contradicted DeLuca's statement that the police offered no assistance for his relative that was being abused. I can go on and on but I think you get the point...I wonder why DeLuca can't get the point and do us all a favor and go away. The other part of Congressman Murphy's presser centered around the passage of the ethics reform bill. The following is a partial crosspost I did on Murphy's presser for My Left Nutmeg. Today, I attended Congressman Chris Murphy's press conference where he talked about the House passage of the ethics reform bill. Followers of Murphy last year are aware that ethics reform was one of his signature campaign themes in his fight against former Congresswoman (a.k.a. medical and special interest lobbyists BFF), Nancy Johnson. For those needing a refresher, here's Murphy blasting Johnson on the subject of ethics during last year's debate in Danbury. 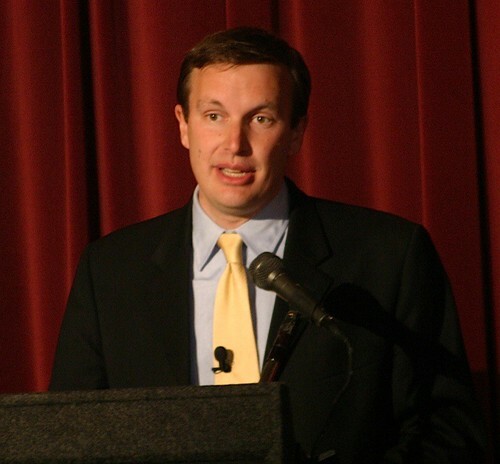 In his short time in Congress, realizing that not delivering on this important issue could be damaging to the party in '08, Congressman Murphy led the charge among freshmen Democrats in fighting for ethics reform in Washington. At a private, members-only meeting Tuesday, Democrats differed over an emerging plan to impose new restrictions on lobbyists, staff and lawmakers, according to some members who attended the meeting. Some Democrats, such as Rep. Christopher Murphy, a freshman from Connecticut, said failure to deliver on their campaign promises to clean up Congress would be damaging now and in next year's election. He was one of a half-dozen freshmen to speak on the topic. "Whether or not we clean up Congress might be the defining issue in my race," Murphy said afterward. "The Republicans are getting more like the Democrats on the big issues. What's going to be left is whether or not people feel Washington has changed." After months of debate, Congressman Murphy can claim to live up to one of his promises with making making ethics reform a reality. In what would be the most sweeping overhaul of ethics rules since the Watergate era, the House today gave final approval to a bill aimed at reining in the influence of lobbyists and repairing Congress' sullied image. The bill require lobbyists to disclose more of their activities, including the campaign contributions they raise from clients, friends and relatives, a key source of their influence. It would require lawmakers to disclose the special-interest items they slip into bills - a process, known as earmarking, that has figured prominently in congressional scandals. And it would deny congressional pensions in the future to lawmakers turned felons. Government watchdog groups hailed the measure as "landmark reform." "For the first time, citizens will be able to get a full picture of how lobbyists and lobbying organizations use money in Washington, D.C., to gain access and influence in Congress," Democracy 21 President Fred Wertheimer said. Some said they would continue to press for more change, including creating an independent Office of Public Integrity to investigate ethics complaints. "We will celebrate the progress today, but we can't stop," said Rep. Chris Murphy (D-Conn.), who won election last year by highlighting ethics. At today's presser, Murphy talked about the passage of the bill. I'm sure everyone remembers the Nor-easter storm that ripped through the Danbury area on April 15th. I'm sure everyone remember the slow response from the Bush administration to terms of addressing the damage the storm did to the area or sending FEMA to Connecticut to offer assistance. Here's a letter signed by the Connecticut Congressional delegation to the President asking for assistance. We are writing to voice our strong support for Connecticut Governor M. Jodi Rell’s April 30, 2007 request that you declare a major disaster for the State of Connecticut as a result of a major nor’easter which produced heavy rain, frozen precipitation, high winds, and coastal, riverine and urban flooding beginning on April 15, 2007. On the morning of Sunday, April 15, 2007, a major nor’easter engulfed the State of Connecticut causing flooding along the Farmington, Housatonic and Connecticut rivers for several days. Flood warnings were cancelled on the Farmington River on April 20, 2007 and on the Housatonic River on April 21, 2007. Flood warnings continued for the Connecticut River until Friday, April 27, 2007 - twelve (12) days after the storm. On April 15, 2007, Governor Rell took all necessary steps under state law when she executed the State Emergency Plan, and ordered activation of the State Emergency Operations Center. Governor Rell urged all motorists to avoid driving on the morning of April 16, 2007 due to widespread flooding. In addition, on April 17, 2007 Governor Rell directed the State Department of Emergency Management and Homeland Security to solicit damage reports from State and local officials. Finally, on April 18, 2007 Governor Rell requested a Federal/State preliminary damage assessment (PDA) pursuant to the Federal Emergency Management Agency (FEMA) regulations. The State of Connecticut’s preliminary damage assessment demonstrates statewide flooding resulted in damage to over 2,406 residential units and more than 179 businesses. Private sector losses are estimated at $31,215,550 and public sector damages are estimated at $11,978,231. These preliminary damage assessments confirm major impacts to residents, businesses, and State and local government units. Governor Rell has determined that the April 15, 2007 major nor’easter is of such severity and magnitude that the financial costs exceed the State of Connecticut and affected local governments capabilities. Supplementary federal assistance is necessary to ensure continued appropriate cleanup and repair operations, and to ensure public safety. Pursuant to the provisions of Section 401 of the Robert T. Stafford Disaster Relief and Emergency Assistance Act, 42 U.S.C. Sections 5121-5206 (Stafford Act), we strongly urge immediate and favorable consideration of Governor Rell’s request for the following federal assistance: (1) Public Assistance for Fairfield, Litchfield, Hartford, and New Haven counties; (2) Individual Assistance which includes Individuals and Households Program, Disaster Unemployment Assistance, Small Business Administration disaster loans, and Farm Service Agency loans for Fairfield, Litchfield, Hartford, New Haven, and Middlesex counties; and (3) that the Hazard Mitigation Program be made available statewide. We thank you in advance for your consideration of this matter. After a delay, FEMA finally came to Connecticut but not everyone on the Danbury area was happy with the response time and voiced their frustration with Congressman Murphy. In turn, today, Congressman Murphy expressed his frustration with FEMA and demanded answers into why it took so long for FEMA to respond to Connecticut's needs. Today, Congressman Chris Murphy (CT-5) aggressively questioned Mr. R. David Paulison, Administrator of the Federal Emergency Management Agency (FEMA) at a House Oversight and Government Reform Committee hearing about the agency's slow response to Connecticut in the aftermath of the mid-April storm that left significant damage behind. "When that spring storm hit Connecticut, small towns didn't have the resources available to them to clean up the mess and quickly address property damage issues. FEMA dragged its feet in declaring a disaster," said Murphy. After the storm, which began over the weekend of April 14 and 15, and continued into Monday, April 16, Connecticut Governor M. Jodi Rell announced that she would ask FEMA to declare portions of Connecticut a major disaster for businesses, homeowners, and municipalities. FEMA did not declare a disaster until May 11 for municipalities only; the agency did not extend that declaration for businesses and homeowners until June 14 - two months after the storm. In response to Murphy's questioning about the delay in declaring a disaster in Connecticut, Mr. Paulison agreed that it took too long in this case, noting that it should take less than two weeks to make the determination. In today's press conference, Congressman Murphy addressed his grilling of FEMA. Yesterday, I attended the The Southern Fairfield County Young Dems BBQ and caught up the man who's looking to give the shameless rubber stamp phony Chris Shays his pink slip in 2008, 4th CD candidate Jim Himes. For those who don't know, recently, Himes raised eyebrows with his impressive fund raising figures for the second quarter and energized the crowd of over 100 who withstood the rain while Himes delivered his vision of change in the way things are done in Washington. I'll post my full video report on the Young Democrats event, as well as more coverage of Himes, later this week. I just attended a press conference with Congressman Chris Murphy and I'll have a full report as well as full audio of the presser later today. From today's article on the new optical scanning machines. In Bethel, elections officials have been preparing for the change for several months, said Mary Legnard, Republican registrar of voters. Optical scan machines were used during the budget referendum in May so officials would be used to them by November. "We no longer use lever machines. They're gone," Legnard said. "I don't see any problems if there is a primary." Bethel Democratic Town Committee chairman Joseph DaSilva said he would prefer that lever machines were still in use because of their reliability. "I think it will be an adjustment for a lot of people. The lines will be longer, because people will take more time to vote. The longer you've been voting, the longer the adjustment will take," DaSilva predicted. Wow, I didn't know that DaSilva moved to Bethel? Not only is the News-Times awful when it comes to covering local government news, they can't even get the elected official names right. Here Marian, let me help you. The Bethel DTC Chairman is Chris Trodahl while the Danbury DTC Chairman is Joe DaSilva. I know it really hard remembering the names of the DTC chairmen in the area...with the Danbury Democratic Headquarters being 0.4 of a mile down the street from the News-Times building and everything. In honor of this great moment in journalism, I present the following video. A ban on old lever voting machines will have voters all over Connecticut casting their ballots by scanner. Connecticut State Secretary, Susan Bysiewicz and Attorney General, Richard Blumenthal held a news conference this afternoon to announce plans to ban the old lever voting machines in all future elections. Connecticut is switching its voting technology to optical scanner machines. This year's municipal elections will mark the first time that the technology will be used statewide. Officials say that voting by optical scanner leaves a reliable paper trail. As everyone is well aware, any post on the reliability of the new voting machines sparks an interesting debate among the MLN community and this topic will certainly come up during the Secretary of State's guest post later this week. Sec. of State Bysiewicz will be our guest on My Left Nutmeg tomorrow and I'll post the transcript of the conversation here on HatCityBLOG. If you have any questions for Sec. of State Bysiewicz, I encourage you to sign up at My Left Nutmeg or read the transcript tomorrow evening. Rounding up video Monday, here's the final installment of Saturday's Danbury Live. The following is footage of the ad hoc committee on post employee benefits. Continuing on the Monday's video theme, Democratic State Rep. Jason Bartlett made an appearance on the public access show "Bethel Today" to offer his opinion on his first term at the State Capitol. Although online polls are in no way scientific, it's good to see that a majority of readers are planning to vote in this year's election while those who are planning on sitting the election out usually a sign of disapproval of the incumbent and/or voter apathy. As a follow-up to the closing of Marcus Dairy, the News-Times did a pretty decent write-up on the sixth reunion of the Southern New York Racing Association. For more information on the cars that once raced at the Danbury Racearena, view the Danbury Racearena Historical Museum website. Before I take off to the Southern Fairfield County Young Democrats BBQ in Bridgeport, here's a quick post of some things I'm planning to touch on this week. • If you haven't already, please download Mayor Boughton's latest Finance Disclosure Report as well as the Republican Town Committees report. We'll have the Democrats breakdown posted online this week. • Don't think for a second that the parade ordinance saga is over...far from it. • With school opening in September, I'm going to pose a question to those who claimed to care about the welfare of Danbury's children. • Another case of irresponsible development is coming to a conclusion and I'll explain why the Republicans in the 1st and 2nd ward, as well as Mayor Boughton should be concerned. • Did BigT put his foot in his mouth again? Wait and see the latest from the man who wants residents to kill members of the immigrant community and why it might be time for the state to launch an investigation regarding remarks made on that disgusting show. 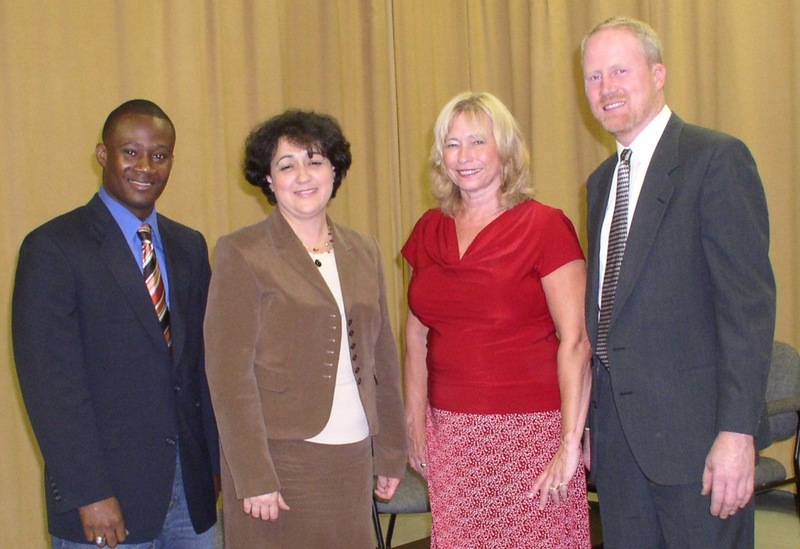 • Be on the lookout for more episodes of Danbury Live posted online. • Is HatCityBLOG being picked up in the mainstream media as well as branching over to public access? Off to Bridgeport and my interview with the man who will defeat Chris Shays in 2008.